With styles that now imitate the look of wood, stone, and clay, metal roofing is finding renewed popularity in homes of all types. The metal roofing industry has taken a page from vinyl flooring manufacturers. They’ve started with a ‘plain Jane’ material—in this case steel or aluminum—and made it look like wood, stone, and clay. The introduction of metal roofing in shingle, shake, slate and tile styles has reinvigorated the metal roofing industry. For decades, metal roofs meant corrugated panels, which looked like they belonged on sheds or barns, or standing-seam applications, which often had a commercial appearance. Today, metal roofing products are available to fit every architectural style, whether a Spanish Colonial in Southern California or a Victorian in New England. Residential metal roofing is generally made of steel, aluminum, or copper. Rolls of 24- or 26-gauge steel sheets are given a metallic coating to prevent rust, followed by a baked-on paint finish. Aluminum sheets don’t require the metallic coating but do get painted. Copper, often called a natural metal product, is neither coated nor painted, because it weathers without corroding. It is sometimes used for special features, such as the roof of a prominent bay window. Steel roofing products are coated with either zinc (galvanized) or a mixture of aluminum and zinc (galvalume or zincalume). Of the two, galvalume offers the longer service. The coatings are offered in several thicknesses—the thicker the coating the longer the service, and the higher the cost. The Metal Roofing Association (MRA) recommends a galvanizing thickness level of at least G-90 for residential applications and an AZ-50 or AZ-55 designation for galvalume coatings. In areas by the sea, opt for an aluminum-based panel. Paint finishes vary in quality, as well. An inferior coating may fade or chalk. Some manufacturers participate in a certification process developed by the MRA. Standard certified products may be used in most areas. In areas with high exposure to UV light, opt for a premium certified paint coating. Metal roofing products can be stamped into many shapes and are typically installed as interlocking panels with hidden fasteners. Viewed from a distance, they offer fairly convincing renditions of shingles and tiles. Some ‘stone-coated’ products receive an acrylic coating, in which stone granules are embedded. These offer a less metallic look. Standing-seam metal roofs look exactly like what they are–long sheets of painted steel with vertical seams. From a design perspective, they are a purer product but not suitable for every home. 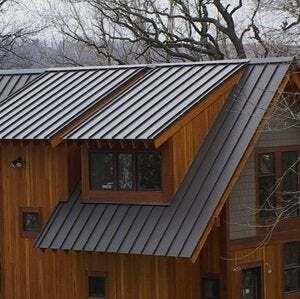 Standing-seam roofs are perhaps best matched to the simple lines of cabins and contemporary home designs. The primary benefit of metal roofing is longevity. Manufacturers routinely offer 50-year warranties and even lifetime, non-prorated warranties. They claim their products will last two to four times longer than roofs with asphalt shingles. By avoiding one or two re-roofing jobs during the life of the metal roof, you will more than offset the higher initial cost. Near term, a new metal roof recoups a bit more of its installation cost upon home resale (6% according to Remodeling Magazine) than does a new asphalt roof. There are other advantages, as well. Metal roofs are lightweight, sometimes allowing them to be installed directly over old roofs. And when metal roofing is painted with specially formulated “cool pigments”, solar energy is reflected and emitted (rather than radiated as heat into the attic). Additionally, metal roofs are effective in preventing the spread of fire when hot embers fall on them (i.e., from brush and forest fires). In fact, some insurance companies will give you a discount if you have a metal roof. In addition, metal roofing is made with a large percentage of recycled metal—often 95 percent—and when its useful life is done, it can be recycled again. No worries about it filling up dwindling space in landfills. * It will increase the likelihood of a lightening strike. Metal conducts electricity, but electricity is not drawn to it. * Metal roofs are noisy in the rain. Not so. They may even be quieter than other roof types. * Metal roofs are susceptible to damage by hail. While extremely large hailstones can dent a metal roof, normal hailstorms will not. With textured roofs, minor denting is not readily visible. * You cannot walk on a metal roof. You can, but you have to know how to do it without causing damage. Check with the manufacturer of the product you choose. * A metal roof will make your house colder in winter. Actually, a metal roof has no effect on the temperature of the typical vented attic in winter. It’s the insulation under (or on top of) the floor of your attic that keeps you warm.